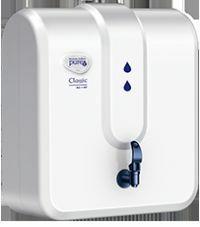 Pureit Classic G2 RO+UV^ with its superior RO purification technology that reduces the maintenance cost and at the same time increases the filter life by 2 times as compared to ordinary water purifiers. 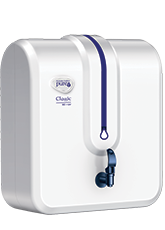 The pureit classic G2 RO+UV^ has a long filter life of 6000 litres as compared to the standard filter life of 3000 litres in ordinary purifiers. Membrane Protector: Microprocessor based frequency modulated waveform producer. Post-RO Carbon Filter: Last level of purification acts like a polisher and enhances the taste of purified water. Pre-RO Carbon Filter: Removes chlorine and organic impurities like harmful pesticides. It also adsorbs bad taste and odour-causing organic compounds from water. Pre-Sediment filter: Pre-Sediment Filter for Heavy Sediment and Particulates (Dirt, Rust, Sand, Silt). It removes fine and coarse particulate impurities and improves life of the Carbon Filter. To Recieve updates and possible rewards for Hindustan Unilever Classic G2 Mineral RO plus UV please sign in. To Recieve updates and possible rewards for Water Purifier please sign in.